Seis chasis y un prototipo de este vehículo se produjeron a principios de 1942. Nunca se fabricó en serie debido a problemas de desarrollo de la torreta cónica. This tank was the first prototype of Germany's Pz.Kpfw. VI Tiger. It's a good combat tank, with good armor and excellent firepower once upgraded, however it is very prone to being ammo racked and having its crew members killed. Since the armour is not sloped at all, it is always reccomended to angle your armour in this tank. With the patch 8.8 changes, the VK 36.01 (H) is now a true heavy tank with very high HP and a good selection of weapons allowing it to work well as a sniper or brawler. VK 36.01 (H)c VK 36.01 A.W. After the 1.2 update VK 36.01 (H) is now a heavy tank with good armor, very high HP, and very accurate guns. The 7,5/5,5 cm Waffe 0725 used to be the best gun choice but there's once again a choice to make over it. The Waffe provides good penetration, high RoF, and accuracy making the tank a highly effective sniper. The mediocre alpha of 135 can be problematic as you're forced to expose yourself more often to keep the damage going. The 8.8 cm KwK 36 L/56 hits much harder while still having decent accuracy and RoF, but suffers from low penetration. While using this gun you will likely have to get a bit closer to take advantage of weak spots, and will very likely need APCR rounds on hand when against tier 8 tanks. The VK 36.01 (H) has very good armor for its tier; this tank is capable of fighting more as a straight-up tank and feels more like a tank ready for production than a prototype. It can get into slug matches against lower tier opponents, it can support, it can snipe, it can do peek-a-boo from around corners, anything you want. The VK 36.01 (H) doesn't have the best maneuverability and horrible turret traverse. While its top speed is only slightly slower than most medium tanks of its tier, its traverse speed is abysmal. The VK 36.01 (H) much better suited to frontal attacks and slug matches. It follows the German doctrine of long range firepower, so one way to counter this tank is to isolate it and then engage it close up with multiple opponents. When the situation calls for it or when you see an opening in the enemy's defenses, take advantage of this opening and harass the enemy from the rear. This tactic is useful in the mid-late game, and has the advantage of surprise, as the enemy team will most likely not expect a "slow and lumbering pseudo-Tiger" to execute a flanking attack. If you came from the VK 30.01 (H) you should have all the guns already unlocked except for the 8.8 cm KwK 36 L/56, and the Waffe can be used on the stock turret. If you came from the Pz IV you will have to start with the 105 howitzer unless the 7,5 cm KwK 42 L/70 was researched from another line. Research the Waffe gun if you don't have it. If you really can't stand the 105, you can stop for the 7,5 cm KwK 42 L/70 first as it costs less than half the XP. Everything can be mounted on the stock suspension, so it can be researched at any point. Research the turret and engine in whichever order you prefer. The turret will add a whopping 190 HP to the tank, while the engine will help with the sluggish mobility. You can skip the 7,5 cm KwK 42 L/70 entirely if you got the Waffe first as it gets researched for free upon unlocking the Tiger. On 9 September 1938, Henschel received permission to continue their work on the DW II. Two similar designs were created, the lighter (32 tons) VK 30.01 (H) and later, the heavier (40 tons) VK36.01(H). Both resembled PzKpfw IVs in their hull design, but their running gear was of a new design that consisted of overlapping road wheels. VK 30.01 (H) medium and VK 36.01 (H) heavy tanks had many parts in common, making their production and service much easier. Only four VK 30.01 (H) prototypes were produced, two in March 1941 and two in October 1941. All were completed in 1942 by Henschel. In early 1942, one prototype VK 36.01 (H) was built, along with 5 prototype chassis. Originally, it was planned to mount the VK 30.01 (H) with a turret armed with the 75mm L/24 or 105mm L/28 gun, but none of the prototypes were actually fitted with turrets. The VK 36.01 (H) was to be armed with the 75mm KwK 42 L/70 (Gerat 725), the 88mm KwK 36 L/56 (mounted in the VK 45.01 (P)'s turret), or the 105mm L/20 or L/28 gun. But just as with the VK 30.01 (H), it was never armed with any weapon. Both designs were completed as prototypes, but their further development was cancelled in 1942 in favor of the development of the VK 45.01 (P) that later became the Tiger 1. Turrets produced for both designs were never mounted and instead, in 1944, six VK 30.01 (H) turrets were used in permanent fortifications: Panzerstellung/Turmstellungs of the Atlantic and West Wall. Their running gear was later modified and used as a base for the Tiger and Panther's running gear. In March 1941, two VK 30.01 (H)s were ready and from August 1941 to March 1942, were converted into 128mm Pak 40 L/61 gun carriers, the Selbstfahrlafette 12.8cm. Another two prototypes completed in October 1941 remained in Henschel's factory in Haustenbek and were used as recovery, training, and test vehicles. 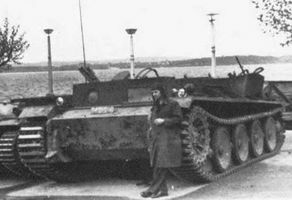 The VK 36.01 (H) prototypes were used as recovery and towing vehicles. The VK 30.01 (H) and VK 36.01 (H)'s design led to the subsequent development of Henschel's Tiger I.